Sci-fi thriller directed by Luke Scott and starring Anya Taylor-Joy in the role of Morgan, a synthetic being with superhuman strength and intelligence. 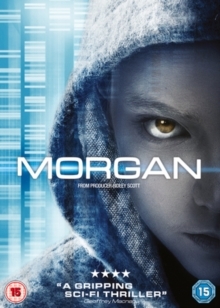 Genetically engineered as an experiment in the next step in evolution, Morgan is kept in a secure facility with very little human contact except for the scientists who made her. After an incident with a temper tantrum, a specialist consultant (Kate Mara) is sent in to investigate Morgan's behaviour, but Morgan is less than happy to be kept locked in a cage. The cast also includes Paul Giamatti, Jennifer Jason Leigh and Toby Jones.